When Medicare was in early development, the goal was to provide affordable, basic health care to all Australians. But a new study has found Medicare spending is higher for children from high socioeconomic backgrounds than their poorer counterparts. Previous studies looking at the distribution of funding of Medicare have focused on adults. They show poorer adults are more likely to consult GPs and richer adults more likely to consult specialists. The overall funding provided by the government favours those with low income once you control for health-care needs. For our new study, we used the Longitudinal Study of Australian Children, a large study assessing over 10,000 Australian children over time, and linked this to the children’s Medicare data. From this, we assessed the amount of Medicare spending on children according to five family income groups, from poorest to richest. We made adjustments to the analysis to make sure we were comparing children with equal health needs. The results of our study show Medicare is fair for government spending on GP consultations for children, but it’s not fair for spending on specialists and testing. Overall, Medicare spending was also not evenly distributed, particularly in the first year of life. The blue line on the graph indicates equal or fair Medicare spending, with a curve below the blue meaning more is spent on richer children. Children from higher income households gained a greater share of Medicare resources over the first 1,000 days of their lives. For children aged zero to one year, the richest 20% used 30% of specialist resources, and the poorest 20% of children used only 12%. As the children grew older, the payments became more even. This is a worrying finding, as we know the first 1,000 days of a child’s life are critical for future health, education and well-being. Children need more health services early in life, and a healthy early childhood is increasingly recognised as protecting against chronic disease in older life. For example, low birth weight is related to increasing rates of heart disease, diabetes and bone disease in adult life. There are many efforts in Australia to ensure all children receive fair health care such as vaccinations, child health nurse visits, bulk billed GP visits and additional school services. Part of the problem could be the patient payment that is often required when seeing a specialist. A recent study found an average co-payment of A$127 to see a paediatrician in Australia, with some costing much more. This may be a barrier to poorer families using specialists for their children’s care. According to the Australian Bureau of Statistics, around 8% of people in Australia who need health care report delaying or not seeking care because of cost. Another explanation could be getting specialist health care to children in rural areas, away from large children’s hospitals. One solution could be to have salaried paediatricians whose services are low or no-cost available in the community, including rural areas. Preferential visits would then be given to lower income children and those with greater health needs. Seeking solutions to these problems, particularly for poorer children and rural children in the early years of life, is critical to the health of our nation. Work is still required to achieve the vision that Medicare be simple, fair and affordable for all Australians. Philip Clarke - Professor of Health Economics, University of Melbourne. This article appeared in The Conversation on 25th of May. The link to the Conversation article is here. The original research Born Equal? 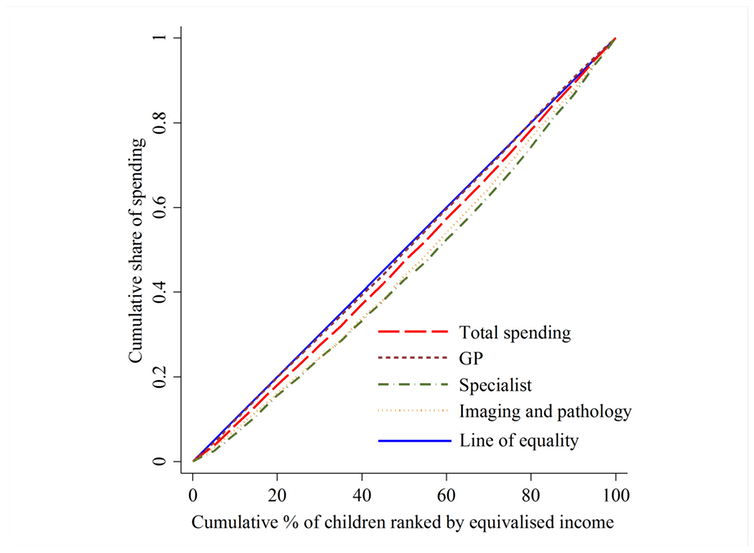 The Distribution of Government Medicare Spending for Children was published in Social Science in Medicine in May 2018.